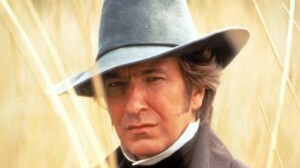 I saw Alan Rickman in a ‘civilian’ moment and have never forgotten it. Ten years ago in the lobby of the Minetta Lane Theatre, Greenwich Village, NYC during intermission at Martha Clarke’s “Garden of Earthly Delights” in the mill of buzzing strangers, there he was, a few feet from me. I poked Ric in the ribs and whispered frantically, “Snape!” Rickman seemed taller and more massive than on screen, the nose, the eyes, the hank of hair falling onto his forehead, utterly vivid in 3-D. I felt every feeling his performances had evoked in me cluster around and arrow through his frame, making him glow and seethe in an otherwise ordinary night. This is what artists do—they give us our selves, our enormous selves. I was a seasoned New Yorker living by the code that we let celebrities have their normalcy and privacy in public, but it was hard not to stare, not to go up and gush. A second, two seconds. I was about to tear my eyes away when the corner of his glance caught mine. Just a flicker and then the faintest of smiles. You can imagine it because you too have seen it on screen. But there in that theatre lobby it seemed to carry a tacit ‘thank you’, a comfortable, magnanimous acceptance of my admiration. It was the briefest fragment of a moment, then gone. As a performer myself, though in a much humbler arena, I know that interchange. People have kindly thanked me for my artistry. It is beautiful to inhabit that societal role, to transport audiences, free them from the clicking, ticking, typing, digging of daily labor, to make a magic carpet they float away on, to toss them into dreams and terrors that safely fade when the house lights come up, to tweak and ping the invisible universe, to light the stardust in their cells. Some of us have bigger careers than others but we till the same field. I have loved being an artist and love artists for being artists. I particularly love Rickman today. Thank you for accompanying me and sharing my writing with friends.